Will I know what to expect in terms of fees and options? Do I really need to see a dentist regularly? I have a single dark tooth, can it be whitened? My old crowns show a dark line at the gums. What can I do about it? My teeth are broken down and worn. I really need a dental miracle! Is there any hope for me? I had an extraction, now what should I do? Dr. Paris and one of our hygienists will assess your oral health and thoroughly examine your teeth, gums, and the bone around them. This includes observing the way your teeth fit together and the way your jaw works. 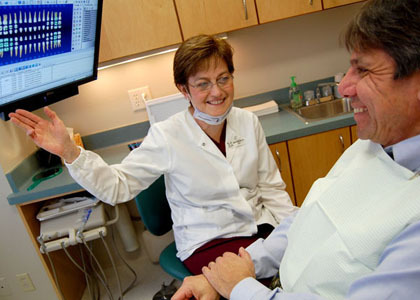 We will perform an oral cancer exam, record any existing conditions, and take any necessary x-rays. We hope to educate you on ways to care for your oral health, which in turn will benefit your whole body. We offer both senior and cash discounts. We also have a credit plan you can apply for through Care Credit. Yes, we do accept Dental Insurance. 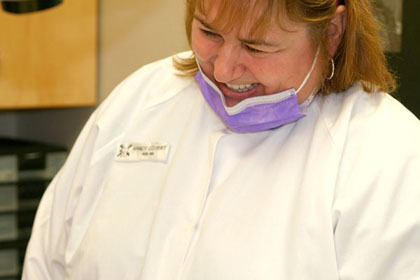 We offer many services to help our patients with their dental benefits. These include verifying your coverage by calling your employer’s dental benefit provider, receiving estimates from that company, learning and disclosing specific parameters of coverage, tracking estimates of yearly benefit allowance, filing your insurance claims, waiting for the portion of payment expected from your insurance company, and protecting our patient’s best interest by promoting better treatment options. Almost half of our patients do not participate in an employer-sponsored dental benefit plan. We are accustomed to working with our patients to find payment options that work for them to achieve optimal oral health for the long term. If you are interested, we review a variety of financing options including payment plans, MasterCard/Visa, or Care Credit and discounts for cash or check payments. Prior to completing any major dental work, we can provide you with a written treatment plan to outline what needs to be done, the amount of time for each appointment and the costs of each phase. 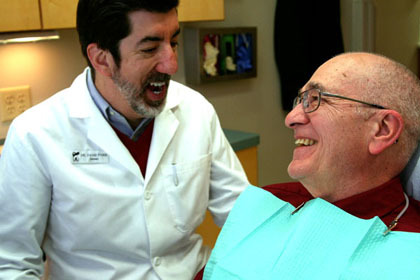 Our staff wants you to understand what we are recommending for your oral health. 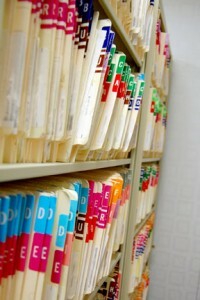 We go over treatment plans, insurance coverage, and payment options with you. If you need more time to talk, we are glad to schedule a time with the doctor or office manager for you to better understand your oral health needs. We can also help you strategize what treatment may need to be done first and what might be able to wait a little longer. Just ask. We try to carefully set up appointments to accommodate your schedule. If your needs change, we appreciate as much advance notice as possible. Please give us at least 24 hours notice if you need to change your appointment. Your time is reserved for you and cancellations with less notice may be charged a missed appointment fee. 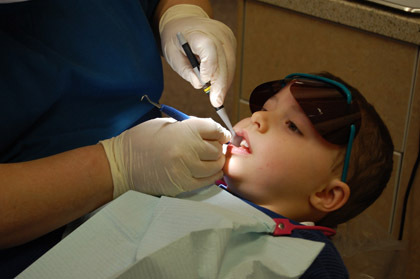 Most children and adults should get a dental cleaning and check-up every six months. People at a greater risk for oral diseases should have dental check ups more than twice a year. Tobacco and alcohol use, diabetes, pregnancy, periodontal gum disease, poor oral hygiene and certain medical conditions are some of the many factors that we take into consideration when recommending how often you need your dental cleaning and check up. Going to your regular check-ups helps to keep your gums and teeth healthy. It helps us detect any problems – such as gum disease, mouth/oral cancer and cavities – at an earlier and often more easily treatable stage. This is a common problem usually caused by a dead tooth pulp. Often this is the result of past trauma to the tooth. It is common for this to happen without pain. The pulp is made of nerve and blood vessels, and when they die the cells break down and stain the tooth from the inside. Usually treatment begins with root canal therapy, after which a bleaching procedure may be used or a tooth-colored porcelain restoration may be placed over the tooth. Many patients have this complaint because, until recently, crowns were done with porcelain fused over a dark metal framework which provided strength. Unfortunately, it is difficult to mask the dark color of the metal which is what causes the dark line around your gums. Today, we have the benefit of being able to use ceramic (porcelain) strong enough to replace the metal that used to be under crowns. This means no darkness at the gum line! If you have teeth that are worn, shifted, missing, broken, or a combination of these, then a full-mouth reconstruction may be the answer. This has the potential to reconstruct and restore your smile and ability to function. It is also important to address the cause of the problem in order to protect your investment.